Today Betty heads out on a four day road trip from Kansas back to California. My goal is to keep you informed of every detail that may delight or inform you. 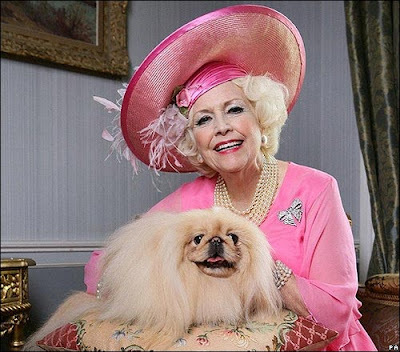 I heard on the radio this morning that it was Barbara Cartland's birthday and remembered this post I wrote a while back. Which One Did She Choose? You Be The Judge. About fifteen years ago an article (I think it was in Parade magazine) featured Barbara Cartland, the queen of the Romance Novel genre, all decked out in her pink flowing gown, eating chocolates on a big fluffy bed made up of satin, ruffles and lace. She was kindly dispensing advice to riffraff like me who were still in bed on Sunday morning. My baggy gray jogging pants and my "I Got Scrod in Maryland" T-Shirt, were getting rather rank as I lolled around on my Rugrats pillow, stolen from one of the children. I was reading the newspaper as I enjoyed my leisurely Sunday morning repast of shredded wheat dipped directly into a jar of peanut butter, with a large glass of Diet Pepsi to wash it all down. Newspapers and cats spread out on the bed completed the tableau. I skimmed over most of the article, but then ran across the words that would cause me to actually sit upright, the jar of peanut butter slipping to the floor and shards of shredded wheat, leaping like lice off my chest to settle onto the sheets below. What was it that caused this reaction? Barbara stated that at some point, a woman must make the decision whether to save her face or her body from the ravages of time. OH GREAT! Another one of those things about Womanhood I learned later than everyone else! I had not gotten this memo. No one had ever told me about this decision. When did I have to make it? Was there a due date? Was there an official agency I needed to send my decision to? Were there penalties for putting off this decision? Did Nature begin withdrawing on both accounts if you did not make the decision on your own? Well, you would think I would have forgotten about this by now. After all, many other pieces of advice and knowledge have sifted through the grey sieve to settle on the floor of my skull, ashes of a brain on fire with intellect and emotion. I'd love to remember how to play the flute. Remembering, oh, say, just half of the information I was exposed to in college would be a bonus. Alas, all those bits of information are gone, gone gone. However, just like a large piece of corn this little decision that "every woman must make" has stuck in the waxy folds of my brain, causing redness and irritation over the years. Oh Barbara. Which decision did you make? I'd really like to know. so, what did you choose? your face or your body? what did dame barbara choose? Hi BB, and safe travels back to CA. Too funny about the cereal. One likes what they like and no substitutes. I can fully understand as I'm a cereal-aholic. 100% fanatical about my Cheerios. I has to be the real thing no the store brand and yes I can tell the difference. Oh geez, what a decision! Can I not choose both? I would love to know what she chose and why. I love your imagery "leaping like lice off my chest to settle onto the sheets below." LOL! The part about your HOB is classic! I hope your trip is a safe and fun one! I'm sorry, I could hardly read the rest of the article when I got to the statement about lice leaping off your chest!